Clement IV, born Gui Foulques, Roman Catholic Pope from 1265 to 1268, son of a successful lawyer and judge, was born at St Gilles-sur-Rhône. He studied law, and became a valued adviser of Louis IX of France. He married, and was the father of two daughters, but after the death of his wife took orders. In 1257 he became bishop of Le Puy; in 1259 he was elected archbishop of Narbonne; and on the 24th of December 1261 Urban IV created him cardinal bishop of Sabina. He was appointed legate in England on the 22nd of November 1263, and before his return was elected pope at Perugia on the 5th of February 1265. On the 26th of February he invested Charles of Anjou with the kingdom of Sicily; but subsequently he came into conflict with Charles, especially after the death of Manfred in February 1266. To the cruelty and avarice of Charles he opposed a generous humanity. 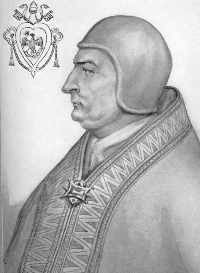 When Conradin, the last of the Hohenstaufen, appeared in Italy the pope excommunicated him and his supporters, but it is improbable that he was in the remotest degree responsible for his execution. At Viterbo, where he spent most of his pontificate, Clement died on the 29th of November 1268, leaving a name unsullied by nepotism. As the benefactor and protector of Roger Bacon he has a special title to the gratitude of posterity.